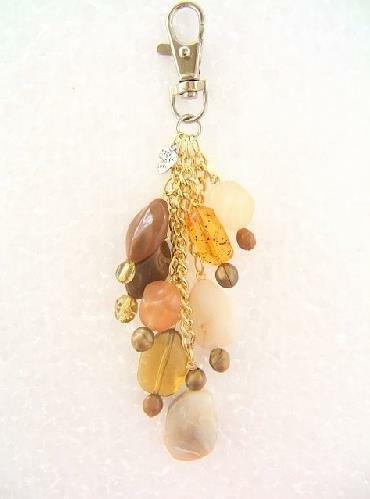 This Handbag Charm has 3 Gold plated chains each with its own seperate designed beads. Cream, Amber and Different shades of Brown. Each chain has 3 different shaped beads. The top of the chain is finished off with a 'made with love' tibetan silver charm. This is a lovely chunky handbag charm and will enhance any Plain Handbag. The charm you see, is the charm you will receive each one is made and designed differently.